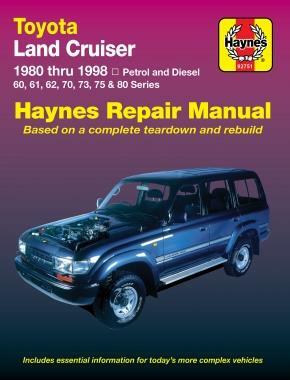 Toyota Land Cruiser (Petrol & Diesel) 1980 - 1998 Haynes Owners Service & Repair Manual covers the Diesel Engined Land Cruiser Hardtop, wagon, utility, cab chassis, troop carrier. Series Covered: HJ60, HJ61, HJ70, HJ75, HZJ80, HDJ80, FJ60, FJ62, FJ70, FJ73, FJ75, FJ80, FZJ80 Does NOT cover BK or Colorado models. Diesel Engines Covered: * 4.0 litre (2H) * 4.0 litre turbo (12H-T) * 4.2 litre (1HZ) * 4.2 litre turbo (1HD-T & 1HD-FT) Petrol Engines Covered: * 4.0 litre (3F) * 4.2 litre (2F) * 4.5 litre (1FZ-FE) Contents: * Introductory Pages About this Manual; Introduction to the Toyota Land Cruiser Diesel; Vehicle Identification Numbers; Buying Parts; Maintenance Techniques, Tools and Working Facilities; Booster Battery (jump) starting; Jacking and Towing; Automotive Chemicals and Lubricants; Conversion Factors; Safety First! ; Troubleshooting * Tune-up and routine maintenance * 4.2L 2F and 4.0l 3F pushrod petrol engine * 4.5L 1FZ-FE DOHC petrol engine * 4.0L 2H and 12H-T pushrod diesel engines * 4.2L 1HZ, 1HD-t and 1HD-FT OHC diesel engines * General engine overhaul procedures * Cooling, heating and air conditioning systems * Fuel and exhaust systems carburetted petrol engine * Fuel and exhaust systems - Fuel injected petrol engines * Fuel and exhaust systems - diesel engines * Charging and Starting systems * Emissions control and engine control systems * Manual transmission * Automatic transmission * Transfer case * Clutch and drivetrain * Brakes * Suspension and steering systems * Body * Chassis electrical system * Wiring Diagrams NOTE: Only maintenance, adjustment, minor repair procedures plus removal and installation are described for the Automatic Transmission. The Toyota Land Cruiser is a series of four-wheel drive vehicles produced by the Japanese car maker Toyota Motor Corporation. Development of the first generation Land Cruiser began in 1951 as Toyota's version of a Jeep-like vehicle and production started in 1954. The Land Cruiser has been produced in convertible, hardtop, station wagon, and utility truck versions, and it is currently Toyota's flagship 4WD vehicle. The Land Cruiser's reliability and longevity has led to huge popularity, especially in Australia where it is the best-selling full-size, body-on-frame, four-wheel drive vehicle.Toyota also extensively tests the Land Cruiser in the Australian outback—considered to be one of the toughest operating environments in terms of both temperature and terrain. * 1967 - Production of the FJ55 began. The FJ55 was a 4-door station wagon version based on the FJ40's Drive-train, replacing the 4-Door FJ45V (I). It was colloquially known as the "Moose". It has also been referred to as a pig or an iron pig. The FJ55 had a longer wheelbase 2710 mm and was designed to be sold in North America and Australia. * Jan 1975 saw the F engine replaced by the 2F engine. Unusually for Toyota, the model (e.g. FJ55) did not change. * Model 56 is in Japan only, with 2F engine ( Jan. 1975 - Jul. 1980 ). The original Toyota Land Cruiser FJ 60 was available for purchase from 1981 through 1987. It is a front engine four door wagon which has available seating of five to seven. 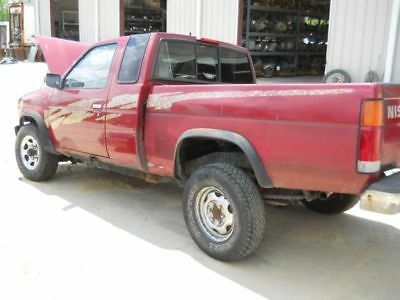 It is well known in the off-roading community for its tremendous 4X4 capabilities, despite being somewhat limited by its poor departure angle. The FJ 60 was offered in the following solid exterior colors: Alpine White, Brown, Desert Beige, Freeborn Red, Royal Blue; and in the following metallic exterior colors: Charcoal Gray, Cognac, Gray-Blue, Rootbeer, Sky Blue, Stardust Silver. In contrast to the FJ 62, the FJ 60 exhibits the classic round Land Cruiser headlights which are replicated now on the retro-style FJ Cruiser. * 1980 - The 60 series was introduced. While still retaining the rugged off-road characteristics of previous Land Cruisers, the 60 was designed to better compete in the emerging sport utility vehicle market. The 60 was given a variety of comforts like air conditioning, a rear heater and an upgraded interior. The FJ60's "2F" petrol engine was left unchanged from the "40" series while six-cylinder 4.0 litre 2H and four-cylinder 3.4 litre 3B diesel engines were added to the product line. * 1981 - Land Cruiser sales surpassed 1 million and a high-roof version was introduced. The 60 was introduced to South Africa when a stock Land Cruiser competed in the Toyota 1000 km Desert Race in the punishing wilds of Botswana. * 1984 - This was the final year for the 40. Specialist suppliers of aftermarket parts and restorers who return old FJ40s to better-than-new condition replace Toyota dealers as the main source of Land Cruiser expertise. * 1984 - Alongside the 60, the Toyota Land Cruiser 70 Series were introduced. 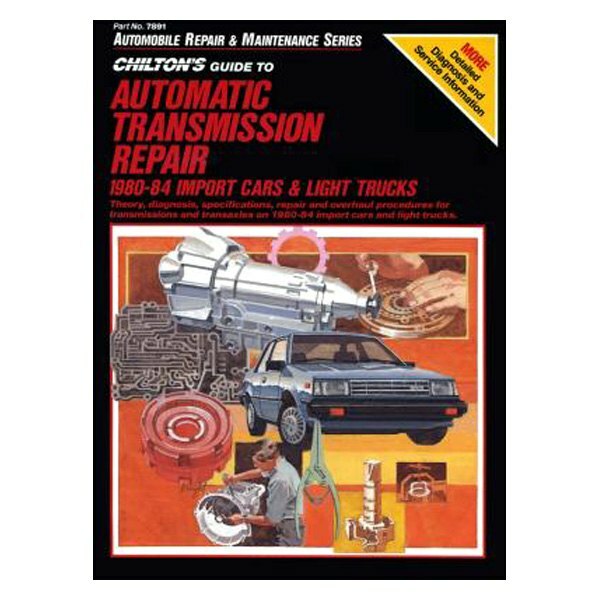 * 1985 - The Direct-injection 12H-T and 13B-T turbodiesel engine were introduced. * 1988 - The petrol engine was upgraded to a 4.0-litre 3F-E EFI engine. The FJ62G VX-Series was introduced allowing the Land Cruiser to be sold in Japan as a passenger vehicle. * 1990 - The 80 series station wagon was introduced, replacing the 60. The 80 was initially offered with a choice of three engines; the 3F-E six-cylinder petrol engine, a six-cylinder the 1HZ diesel and 1HD-T direct injection turbodiesel. 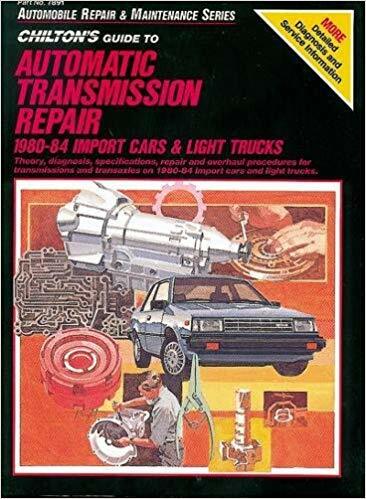 * 1990 - All 80s sold in North America and Europe now have a full-time four-wheel drive system. In Japan, Africa and Australia, a part-time system was still available. 80s produced between 1990 and 1991 had an open centre differential which was lockable in 4HI and automatically locked in 4LO. 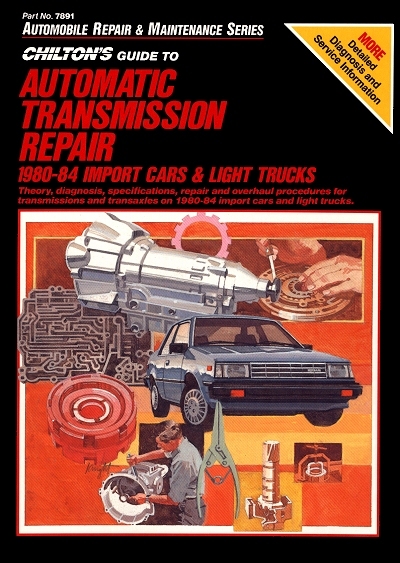 From 1992 onward, vehicles with anti-lock brakes had a viscous coupling that sent a maximum of 30% torque to the non-slipping axle. The differential was lockable in 4HI and automatically locked in 4LO.